One of the many companies that makes online casino games is called BetSoft. They most definitely aren’t in the top three of the biggest brands in the world, but hey, they’re still pretty far up there. Their slots can be found at many famous online casinos and that alone is proof of how big they are. And if you want to try your luck on one of their products, then all you need to do is visit one of the BetSoft casinos that are listed on this website, create an account and go for that big win! We already mentioned that this developer is responsible for a fair number of slots, but those aren’t the only games that they have made in the past. BetSoft has also created some keno games, scratch cards, video poker games and even online table games, meaning their product portfolio is pretty diverse. But that isn’t really what they’re known for. This developer is mostly famous for its 3D online slots, which really do look absolutely fabulous. These games have particularly advanced graphics and at the same time they offer many different bonus features which will give you a chance to run into a big win. And let’s be honest, who doesn’t enjoy some nice animations? The BetSoft games are generally available for both desktop and mobile devices, as long as they have Adobe Flash downloaded. That’s right, all of their products run on flash, which sounds pretty… flashy, right? In a sense that is true, or at least it used to be. Flash used to be state of the art technology for online casino games and that is probably why BetSoft made all of its products run on this platform. But at this point, html5 is the way to go, so hopefully they will update their slots to html5 in the near future. That should make the games run even smoother, while mobile support will become an automated feature. When you look at the official website of BetSoft then you will find a limited number of slots in their game lobby. Don’t get the wrong idea though, because this developer has made a huge amount of games over the years. This includes the one and only Slotfather slot, which is obviously a big fat wink to the famous Godfather movies, and jackpot games like The Glam Life. That last game might seem a bit familiar, by the way… In many ways it looks like the Mega Fortune slot which was made by Netent, as it has a ‘living the high life’ theme, as well as a progressive jackpot which could be won at any time. More recently, BetSoft has also released other games which tend to be a bit better looking. This includes The Golden Owl of Athena, Ogre Empire, Reels of Wealth, Tigers Claw, Sugarpop 2 Double Dipped, Legend of the Nile, and Stampede. Every single one of those games is either a video slot or a 3D slot, so it’s pretty obvious which types of products this developer is focusing on at the moment. 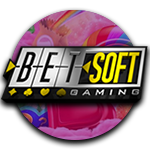 If you enjoy high-quality graphics while you are trying your luck at an online casino then we would whole-heartedly recommend the products that are made by the software developer called BetSoft. Their slots have bonus features which are pretty fun, and you can win pretty decent amounts of money while playing them, but their main quality is still the collection of flashy animations. So play them today and be amazed by how good they look!